Host density impacts on community stability by affecting the peak phage densities that follow community-wide host lysis. With more phage than hosts within a batch-culture system, eventually all sensitive bacteria may become adsorbed and lysed (10, 29). However, in continuous culture there will be decay in free-phage densities due to outflow from the growth vessel. Since the rate at which host cells are found by free phage is a function of free-phage density (1), there is a race between the survival of phage-sensitive bacteria and free-phage outflow. The lower the peak phage density, the less the bacterial population will be reduced in size due to phage adsorption, and the greater the likelihood that phage adsorption will not reduce the bacterial population to the point of extinction. The smaller the density of bacteria available for infection within a chemostat, in turn, the lower the peak phage density. Bohannan and Lenski (14) demonstrated this point experimentally by reducing the bacterial growth potential through restrictions in the density of a limiting nutrient (glucose) and then observing an increase in phage-bacterial community stability. See figure 5-3C for a simulated chemostat in which the nutrient density in the reservoir has been reduced by one half, and again note that extinction of bacteria and phage is avoided. The productivity of page infections and infection density together determine peak phage densities. It is well known that phage growth parameters such as lysis timing and burst size can vary as a function of temperature, host nutrition status, phage multiplicity, and host physiology vis-a-vis the standard bacterial growth curve (1-4, 8, 34, 42, 57, 65, 69, 74). If the stability of a chemostat is an inverse function of peak phage density (i.e., more phage = less stability), then reduced infection productivity given reduced nutrient availability should contribute to an increase in community stability. 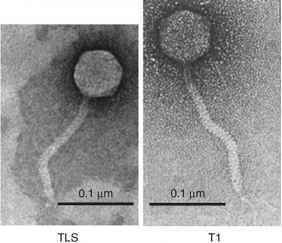 Similarly, we might expect that the T-even-phage lysis-inhibition phenotype (1-4) would be destabilizing since it contributes, particularly at higher host densities, to a larger phage burst size. In figure 5-3D the impact on community stability of reducing the phage burst size by one half is explored, with bacteria and phage extinction yet again avoided.